This 10 inch Made in Germany Eagle Hallmark Hand Painted Plate is in very good condition with only very small scratch marks on the painted portion of the inside. (see photo) A bit of gold gilding wear on the handled ends, yet in great condition with no chips, cracks, hairlines of flaws that we can see. The Hallmark is the Golden Eagle Hand Painted Germany mark very plainly evident. These plates are dated between 1904 and 1924 in the references we find. Beautiful hand painted florals that will showcase any collection or decor. 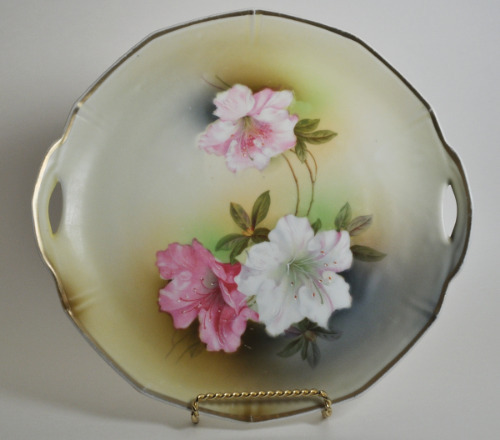 Note: This is one of several old plates, platters, and serving dishes from the late 1800's through the early 1900's, so please visit our other listings as well! IMPORTANT SHIPPING NOTE: This will ship very carefully packed, double boxes, and USPS Priority Mail for faster and safe delivery to you.